Theodorus "Theo" van Gogh (Dutch pronunciation: [teːjoːˈdoːrɵs ˈteːjoː vɑŋ ˈɣɔx]; 1 May 1857 – 25 January 1891) was a Dutch art dealer. He was the younger brother of Vincent van Gogh, and Theo's unfailing financial and emotional support allowed his brother to devote himself entirely to painting. Theo died at the age of 33, six months after his brother died at the age of 37. Theo is widely known for his influence on his brother; however, this often overshadows the significant impact that Theo made on the art world as a renowned art dealer: Theo played a crucial role in the introduction of contemporary Dutch and French art to the public. 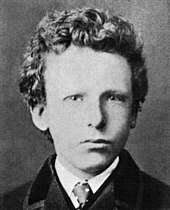 Theo van Gogh in 1873. This photograph was believed to show Vincent, but in 2018 was reassigned to Theo. 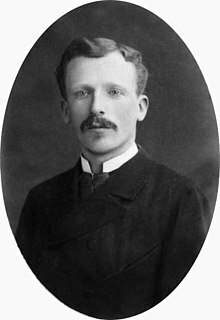 Theodorus "Theo" van Gogh was born on 1 May 1857 in the village Groot-Zundert in the province of North Brabant, Netherlands. He was the son of Theodorus van Gogh and Anna Cornelia Carbentus. His elder brother was artist Vincent van Gogh (1853–1890). Theo worked for some years at the Dutch office of the Parisian art dealers Goupil & Cie in The Hague. Theo joined the Brussels office on 1 January 1873 as their youngest employee. After Theo was transferred to the London office, he moved to the office in The Hague, where he developed into a successful art dealer. By 1884, he was transferred to the Paris main office. Beginning in the winter of 1880–1881, he sent painting materials as well as monthly financial support to his brother and painter Vincent van Gogh, who was then living in the Netherlands. In Paris, Theo met Andries Bonger and his sister Johanna. He married Johanna in Amsterdam on 17 April 1889 and they moved to Paris. Their son Vincent Willem was born in Paris on 31 January 1890. On 8 June, the family visited Vincent, who was living near Paris in Auvers-sur-Oise. Vincent died in July 1890 at age 37. Theo suffered from dementia paralytica, an infection of the brain, and his health declined rapidly after Vincent's death. Weak and unable to come to terms with Vincent's absence, he died six months later (25 January 1891) at age 33 in Den Dolder. Theo's great-grandson, also named Theo van Gogh, was the controversial film director, who was murdered on the streets of Amsterdam in 2004 by an Islamic extremist after making a short film critical of Islam. This 1887 portrait by Vincent van Gogh, long thought to be a self-portrait, was reassessed in 2011 to be one of his brother Theo van Gogh. Theo admired his elder brother Vincent for his whole life, but communicating with him proved to be difficult, even before Vincent opted to follow his artistic vocation. The communication between both brothers suffered from diverging definitions of standards, and it was evidently Theo who kept on writing letters. Vincent is known to have not kept the letters Theo sent; on the other hand, Theo kept every scrap of correspondence from his brother. Therefore, mostly Vincent's answers survived and few of Theo's. Theo was often concerned about Vincent's mental condition and he was amongst the few who understood his brother. It is known that Theo helped Vincent to maintain his artist lifestyle by giving him money. He also helped Vincent pursue his life as an artist through his unwavering emotional support and love. The majority of Theo's letters and communications with Vincent are filled with praise and encouragement. Vincent would send Theo sketches and ideas for paintings, along with accounts of his day to day experiences, to the delight and eager attention of Theo. While it is true that Theo is best known for being the brother of Vincent van Gogh and that one of the major roles of Theo van Gogh's life was his influence on Vincent's career, Theo himself made many important contributions within his lifetime. Theo's work as an art dealer and the important effect he had on the art world are often overshadowed because of his relation to Vincent, but Theo played a vital role in the introduction of contemporary Dutch and French art to the public. Theo was instrumental in the popularity of Impressionist artists such as Claude Monet and Edgar Degas by persuading his employers, Goupil & Cie, to exhibit and buy their works. In 1886, Theo invited Vincent to come and live with him in Paris, and from March they shared an apartment in Montmartre. Theo introduced Vincent to Paul Gauguin, Paul Cézanne, Henri de Toulouse-Lautrec, Henri Rousseau, Camille Pissarro and Georges Seurat, and in 1888 he persuaded Gauguin to join Vincent, who had moved to Arles in the meantime. The two brothers maintained an intensive correspondence, with Theo often encouraging his depressed brother. Theo was one of the few people who Vincent could talk to and confide in. These letters are one of the main and only sources of information about Vincent's life, providing many detailed accounts of not only the occurrences but also the thoughts and feelings in Vincent's life. Over three-quarters of the more than 800 letters Vincent wrote during his life were to Theo, including his first and his last letters. It is largely thanks to Theo and his wife that these letters are available today. Hardly any of Theo's letters remain because Vincent failed to keep them. The letters have been collected and published in book form as The Letters of Vincent van Gogh. The relationship between the two brothers was the subject of the movie Vincent & Theo (1990), directed by Robert Altman. It also formed an important part of the film Lust for Life (1956), which was directed by Vincente Minnelli. Theo was played by the British actor James Donald and Vincent by the Hollywood star Kirk Douglas. Theo's health deteriorated in the months after the death of his brother. He was admitted to the Willem Arntz Hospital, a psychiatric hospital, in Den Dolder on 18 November 1890. He had been diagnosed in Paris as suffering from a progressive and general paralysis. Initial examination confirmed this diagnosis. By 1 December his medical notes confirmed he presented all the symptoms of dementia paralytica, a disease of the brain. He died on 25 January 1891. The cause of death was listed as dementia paralytica caused by "heredity, chronic disease, overwork, sadness". In 1914, Theo's body was exhumed and reburied with his brother at Auvers-sur-Oise. ^ In isolation, van is pronounced [vɑn]. ^ a b Belinda Thomson (1999). "Theo van Gogh. Amsterdam, Van Gogh Museum". The Burlington Magazine. 141 (1158): 567–569. JSTOR 888614. ^ Jan Hulsker (1990). Vincent and Theo van Gogh: A Dual Biography. Fuller Technical Publications. ^ Voskuil, PH. "[Theo van Gogh's medical record]". Ned Tijdschr Geneeskd. 136: 1777–80. PMID 1407128. ^ Deborah Hayden (2003). Pox: Genius, Madness, and the Mysteries of Syphilis. Basic Books. p. 152. ISBN 978-0-465-02881-8. ^ a b van der Veen, Wouter; Knapp, Peter (2010). Van Gogh in Auvers: His Last Days. Monacelli Press. pp. 260–264. ISBN 978-1-58093-301-8. ^ "Portrait of Theo van Gogh, 1887". Van Gogh Museum. Retrieved 20 July 2010. ^ a b Irving Stone (1937). Dear Theo: The Autobiography of Vincent Van Gogh. The New American Library. ^ "Vincent van Gogh(Dutch Painter)" . Britannica. Retrieved 25 September 2011. ^ "Important figures in the life of Vincent van Gogh", Van Gogh Gallery. Retrieved 22 May 2011. ^ Ronald de Leeuw (ed.). The Letters of Vincent Van Gogh. Penguin Group. ISBN 0-7139-9135-6. ^ Leo Jansen; Hans Luitjen; Nienke Bakker, eds. (2009). Vincent van Gogh - The Letters: The Complete Illustrated and Annotated Edition. Thames and Hudson. ISBN 0-500-23865-0. ^ "Vincent van Gogh: The Letters". Van Gogh Museum. Retrieved 20 July 2011. ^ "La tombe de Vincent Van Gogh – Auvers-sur-Oise, France". Groundspeak. Retrieved 23 June 2009. Wikimedia Commons has media related to Theo van Gogh (art dealer). Anonymous (initialled "H.H.H." and "W.F.d.C.H. "): Van Gogh, 's-Gravenhage, Nederland's Patriciaat 50, 1964, pp. 171–183. Hulsker, Jan: Vincent and Theo van Gogh: A Dual Biography, Ann Arbor, Fuller Publications, 1990. ISBN 0-940537-05-2. Jansen, Leo, and Jan Robert: Kort geluk. De briefwisseling tussen Theo van Gogh en Jo Bonger, Waanders, Zwolle 1999. ISBN 90-400-9353-9 (also available in English). Rewald, John: Theo van Gogh, Goupil, and the Impressionists, Gazette des Beaux-Arts, January & February 1973, pp. 1–107; reprinted in Rewald, John: Studies in Post-Impressionism, Thames and Hudson, 1986, pp. 7–115 (no ISBN).